As I mentioned in my first post of the month, I’m interested in learning about the conservation status of rodent species. I think I may have overlooked the threats facing them because several species (notably the black and Norwegian rats) have been incredibly successful invasive species. When I started looking through the literature, I found that there is something of a split when it comes to conservation status: some species are surviving precariously and others are living large. It’s no surprise that I found a good number of studies detailing the negative impacts of invasive rodent species– given the success with which house mice and black and Norwegian rats have been our traveling companions, we should expect them to have wide-ranging impacts. In addition to causing problems for nesting seabirds as I mentioned in an earlier post, these species are also a threat to passerine birds in Hawaii (VanderWerf 2001) and even their own closer relations- introduced rats in Madagascar, for example, use many of the same resources as the 14 native species of rodent (Goodman 1995) and the competition between the species is likely to continue increasing as more and more habitat is lost. This could be a problem for the native species of Madagascar, since a study by Bolger et al. (1997) in California found that native rodent species were more likely to disappear from habitat fragments than introduced species. 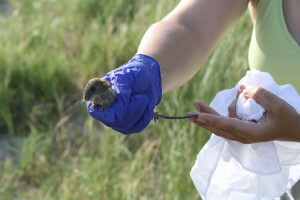 Marsh rice rats are common along the Gulf Coast, but I haven’t trapped them at all of my sites- not exactly sure why. Native rodent species are threatened by other issues as well. It might surprise you to learn (I was certainly astounded) that 51% of the terrestrial mammal species that have gone extinct within the last 500 years were rodents (Ceballos & Brown 1995)- why are we not hearing more about this? According to Amori and Gippoliti (2001) Brazil’s Atlantic Forest is a hotspot of threatened rodent species in the Neotropics. One species of spiny rat (Trinomys eliasi) has been reduced to only two populations in the wild, one of which is in a human-impacted area (Brito & de Souza Lima Figueiredo 2003). By 1996 nine species of Australian conilurine rodents had already gone extinct (Smith & Quin 1996). What is causing rodent population declines? Several of the usual suspects make an appearance in this one- habitat loss and degradation are clearly issues. Whether it’s habitat becoming fragmented, as in California, or changes in vegetation height caused by large herbivore (for example sheep or cows) grazing (Smit et al. 2001), some rodent species are losing access to the resources they need. Invasive species are also a problem, sometimes as competition, sometimes as predators, and sometimes because of what they help predators do- in Australia, the presence of predatory red foxes and domestic cats is amplified by the invasive prey species (Smith & Quin 1996). Normally a predator would not hunt a prey species to extinction because, as the prey becomes less abundant, the number of predators is also reduced- in the case of Australian rodents, however, the abundance of invasive prey species (especially rabbits), gives predators enough other food options to keep their populations, and pressure on native species, up. For other species, like the prairie deer mouse, we’re not sure what is causing the decline (Pergams & Nyberg 2005). Why should we be worried about rodent species– don’t we have too many rats as it is? Small rodents tend to eat a lot of vegetative matter, including seeds. While this could be a problem for rare plant species, when rodents focus on more prolific plant species they can help maintain a diverse plant community (Brown & Heske 1990). And since many seed-eating rodents tend to store food for leaner times, not all of which seeds are recovered for food, those forgotten caches can be really important in helping seeds disperse into a wider area. In the case of antelope bitterbrush seeds at a western Nevada site, for example, more than 99% of new seedlings were the result of chipmunk caches (Vander Wall 1994)- that’s pretty fantastic! At least one study has suggested that we could even take advantage of this trait to promote seed dispersal (Longland & Bateman 1998) by providing ‘decoy seeds’ that could be stored and then neglected as rodents consume their favorite seeds first. So although some rodent species have been entirely too successful in our eyes, other species are facing uncertain futures. For my next post, I’ll take a look at more recent developments in rodent conservation and try to get a sense of efforts being made to support populations in trouble. Amori, G and S Gippoliti. 2001. Identifying priority ecoregions for rodent conservation at the genus level. Oryx 35: 158-165. Bolger, DT, Alberts, AC, Sauvajot, RM, Potenza, P, McCalvin, C, Tran, D, Mazzoni, S and ME Soule. 1997. Response of rodents to habitat fragmentation in coastal southern California. Ecological Applications 7: 552-563. Brito, D and M de Souza Lima Figueiredo. 2003. Minimum viable population and conservation status of the Atlantic Forest spiny rat Trinomys eliasi. Biological Conservation 112: 153-158. Brown, JH and EJ Heske. 1990. Control of a desert-grassland transition by a keystone rodent guild. Science 250: 1705-1707. Ceballos, G and JH Brown. 1995. Global patterns of mammalian diversity, endemism, and endangerment. Conservation Biology 9: 559-568. Goodman, SM. 1995. Rattus on Madagascar and the dilemma of protecting the endemic rodent fauna. Conservation Biology 9: 450-453. Longland, WS and SL Bateman. 1998. Implications of desert rodent seed preferences for range remediation. Journal of Range Management 51: 679-684. Pergams, ORW and DW Nyberg. 2005. Evaluating the predicted local extinction of a once-common mouse. Conservation Biology 19: 1312-1317. Smit, R, Bokdam, J, den Ouden, J, Olff, H, Schot-Opschoor, H, and M Schrijvers. Effects of introduction and exclusion of large herbivores on small rodent communities. Plant Ecology 155: 119-127. Smith, AP and DG Quin. Patterns and causes of extinction and decline in Australian conilurine rodents. Biological Conservation 77: 243-267. Vander Wall, SB. 1994. Seed fate pathwats of antelope bitterbrush: dispersal by seed-caching yellow pine chipmunks. Ecology 75: 1911-1926. VanderWerf, EA. 2001. Rodent control decreases predation on artificial nests on O’ahu ‘Elepaio habitat. Journal of Field Ornithology 72: 448-457.